It's something many runners both loathe and fear, but you'll be hard pressed to find a coach who doesn't recommend it. Hill workouts are the lung-busting, quad-burning sessions that have long been a part of most endurance training programs. If you're one of those runners who looks to understand the reasoning behind each and every workout, consider a recent study that suggests that running up hills just might be the key to helping you run down a 5K PR. The research out of New Zealand rounded up a group of runners to complete a 5K time trial, followed by a six-week hill training regimen. At the conclusion of that training, they challenged them to another 5K-time trial, discovering that their times improved, on average, by an impressive 2 percent. For someone who runs a 28-minute 5K, that's nearly a 1-minute improvement. Even if you're training for something further than a 5K, there's no doubt that hill training can contribute to better performance. 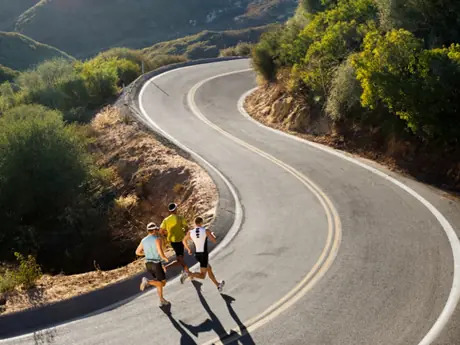 "Hills are a great tool to have in your workout toolbox for runners of any distance, from the sprints to the ultras," says Mark Hadley of Maximum Performance Coaching in Charlotte, North Carolina. Even if the race you're gearing up for is relatively flat, there are benefits to including hill workouts in your 5K training plan. "In general, hill training improves overall strength while doing real time running," explains Dan Flynn, a coach based in Boston, Massachusetts. "Many people don't activate their glutes when they run, which can lead to problems. Running up hills forces you to do that." That added strength in the leg muscles will translate into better efficiency over added mileage and intensity. Not to mention, an overall stronger kinetic chain means fewer injuries and hiccups in training. "If you look at the leg as a fulcrum, the power in our running stride is generated largely from the top of the fulcrum, the hips, glutes and thighs," Hadley says. "Hill workouts place the greatest emphasis on this area, building strength at the top of the fulcrum where it is most beneficial." In addition to strengthening some of the most powerful muscles you have, hill training can also help improve your running form on flats, hills and everything in between. "Hill work opens up the hips and requires you to push down on the ground more forcefully, so you're teaching your body to be in that powerful position at all times," Flynn says. It also requires you to effectively utilize your upper body, thereby teaching proper utilization of your arms. To be sure, hill training can contribute to rounding your mind into shape too. "This type of training can build great mental strength through the increased focus necessitated from working at higher intensities and through the confidence gained in having conquered a visible challenge," Hadley adds.